My Perfect Wash and Go! I have finally perfected my wash and go's! I've had great wash and go days but I was constantly struggling with trying to eliminate frizz. 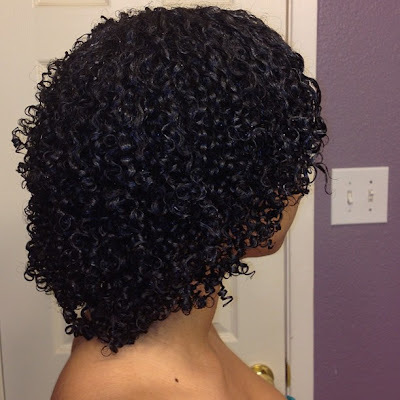 Today as I browsed through YouTube I payed close attention to Mahogonaycurls technique and how she achieves her wash and go styles. One technique in particular was what caught my attention and had the little voice in my head say, "try it! I really believe this will work for your hair as well". I did not even finish watching the video when I found myself in the bathroom trying this new technique. The technique is simple, all I did was apply Eco styler gel on my dry hair (you can also do it on wet or damp hair, just wanted to minimize my shrinkage- why I chose to apply the gel on dry hair) and section it off in really small sections. Apply the gel and continue until fully done- my hair looks and feels very moisturized, which is exactly what I've been longing for with my wash and go's.